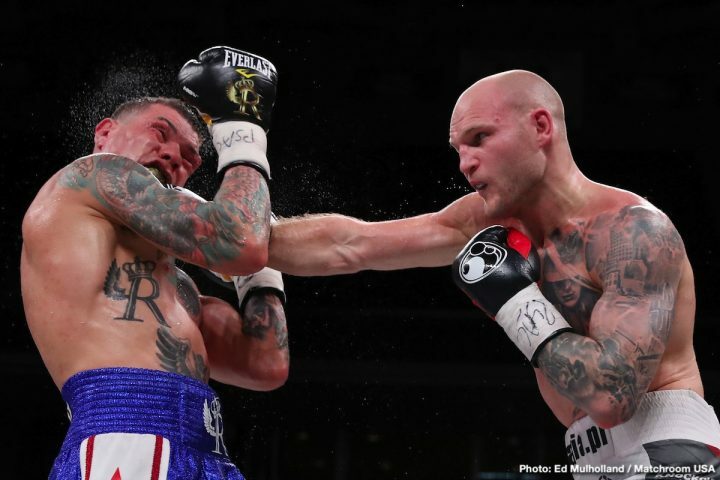 By Mike Smith: Maciej Sulecki (28-1, 11 KOs) earned himself a world title shot against undefeated WBO middleweight champion Demetrius Andrade (27-0, 17 KOs) last Friday night with an exciting 10 round unanimous decision win over high level journeyman Gabriel Rosado (24-12-1, 14 KOs) on DAZN at the Liacouras Center, in Philadelphia, PA.
Sulecki, 29, needed the win over Rosado to put himself into position to face Andrade, 31, in June in a fight that will be shown on DAZN. Andrade’s promoter Eddie Hearn of Matchroom Boxing USA will still need to negotiate the fight with Sulecki, but that shouldn’t be a problem in putting this interesting fight together. Sulecki, 6’1″, has got the tools to potentially unseat Andrade as the WBO 160 lb champion. Sulecki’s size, punch accuracy, and his good punching power could be an issue for Andrade if he’s able to land his shots like he was doing last night against Rosado. Sulecki seemed to gas a little in the ninth and tenth rounds after getting caught with a couple of big shots from Rosado. Sulecki hit the deck in the ninth, and then was knocked down a second time. Sulecki fought smart in the 10th, and got the decision by the scores 95-93, 95-91 and 95-91. While Rosado wasn’t happy with the loss, it was clear who the winner was in the eyes of the boxing fans. Sulecki controlled the fight in the first eight rounds, knocking Andrade down in the 1st and 8th rounds. Sulecki could have finished the job in the eighth if he’d been able to get to Rosado, who was circling the ring constantly after getting dropped hard. Rosado was smart to get on his bike to get away from Sulecki. In hindsight, Sulecki should have rushed Rosado with quick feet and finished him. Sulecki was too patient, as if he felt there was no need to go after Rosado. It’s a good quality for a fighter to have, but when you’ve got a guy hurt, it’s better to go all out with a flurry of shots, because the referee often stops the fight even with the hurt fighter still on his feet. Sulecki likely could have forced the stoppage in the eighth round if he’d been able to stay with Rosado, and not let him move around the ring after he was knocked down and badly hurt. Andrade is coming off of a 12th round knockout win over voluntary challenger Artur Akavov last January. Andrade had little problems with the shorter 5’8″ Akavov, who lacked the size, power and speed to compete at a high level. Akavov did land some nice shots in a couple of the rounds, but he lacked the power to fight on even playing field. The stoppage was questionable. The referee stopped the bout after Andrade hit Akavov with a shot that knocked him off balance in the 12th. Sulecki is going to be a lot tougher opponent for Andrade than the fighters he’s been facing recently. we could see an upset if Sulecki puts it on Andrade like he was doing against Rosado in the first eight rounds. Sulecki came close to beating Daniel Jacobs last year in April. Sulecki got sloppy and was knocked down in the 12th, and he’d gotten the better of Jacobs in many of the rounds. The scoring for the fight didn’t reflect how well Sulecki did, however. Two of the judges had Jacobs winning wide by the scores 116-111 and 117-110. This writer saw Jacobs winning a very close decision by a 115-112 score. With a little more power on his shots, Sulecki could have stopped Jacobs. He was giving Jacobs a lot of problems throughout the contest. In other action on the card, unbeaten women’s lightweight champion Katie Taylor (13-0, 6 KOs) defeated Rose Volante (14-1, KOs) by a 9th round knockout. Taylor knocked Volante down in the first round. In the ninth, Taylor finished off Volante with a storm of heavy shots. The fight was stopped by referee Benjy Esteves at 1:40 of round nine.